There's a mystery to solve, and it's time for you to take on the persona of the World's Greatest Detective! Gathering together all your brainpower, there's a huge casebook of mysteries ready for you to cast your detective eye over. Sally Morgan's brilliant "The Casebooks of Sherlock Holmes" series is a brilliant homage to Sir Arthur Conan Doyle's peerless character. In a kid-friendly treatment of the character, this compendium of mysteries can be solved by gathering clues throughout the book and piecing together a case. "The Cherry in the Cake", "The Cursed Cartouche" and "The Terror of Traymar House" are three distinctly different cases that you (and the great detective) can pit your wits against. We're always looking for folk who adapt and adopt Conan Doyle's characters in new and interesting ways, and this is one of the best treatments we've seen so far. 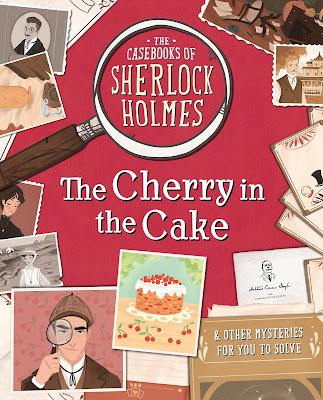 "The Casebooks of Sherlock Holmes: The Cherry in the Cake and Other Mysteries" by Sally Morgan is out now, published by Studio Press (kindly supplied for review).